^ Mittermeier, R.A.; Konstant, W.R.; Hawkins, F.; Louis, E.E. ; Langrand, O.; Ratsimbazafy, J.; Rasoloarison, R.; Ganzhorn, J.U. ; Rajaobelina, S.; Tattersall, I.; Meyers, D.M. (2006). ^ McConnell, William; Kull, Christian (2014). ^ a b McConnell, William; Kull, Christian (2014). ^ Allnutt, Thomas; et al. (2008). ^ Harper, Grady; Steininger, Marc; Tucker, Compton; Juhn, Daniel; Hawkins, Frank (2007). ^ Kull, Christian; Tassin, Jacques; Rangan, Haripriya. 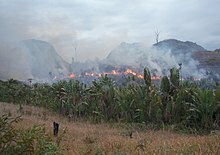 ^ "Deforestation of Tropical Rainforests - A Case Study of Madagascar" (PDF).